One of Germany’s finest heavy metal exports, Sinner have never really been a hugely successful band in terms of albums sales, which is a damn shame as they’re one of metal’s finest creations. ‘Bottom Line’ is one of their more well known and popular albums. Originally released back in 1995, the band was riding on a high, having supported such legends of the genre as Mr Big and Savatage. The album spent a few weeks in the Japanese album charts and helped the band build a loyal fanbase worldwide. 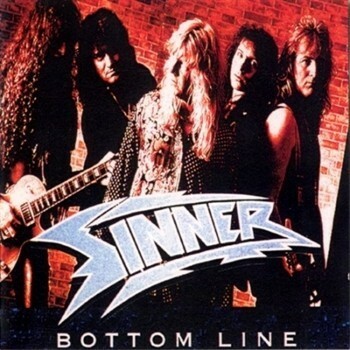 With a line-up of singer/bassist Mat Sinner, guitarists Alex Beyrodt (who is now the German bands Primal Fear and Voodoo Circle) and Tom Naumann, drummer Fritz Randow and keyboardist Frank Roessler, ‘Bottom Line’ is a damn fine album. Eleven years later and ‘Bottom Line’ still sounds great. Fantastically produced by Mr. Sinner himself, every song has something to offer. One of the standout tracks is ‘All Men Are Heroes’ which is a mix of early Saxon and Savatage with Sinner’s gruff vocals and some progressive riffs. ‘I Can’t Stop The Fire’ could have passed as a Ratt song while the band slows down for the typical ballad ‘We’ll Make It Alright.’ There’s a killer bass line rippling through ‘Mercy Killer’ and ‘Hearts Of Steel’ is a toe-tapping riotous monster of a song. Anyway, you get the picture – there’s next to nothing wrong with this album. This reissue includes live versions of ‘Rage Of A Hurricane’ and ‘The Biggest Lie.’ The band is on fire throughout both tracks, showing their strength as a live outfit. So what you get here is 14 tracks of juicy heavy metal. No frills. No pretensions. Just good ‘ol Euro style metal. 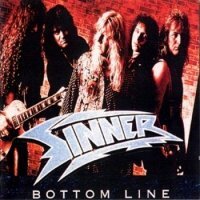 ‘Bottom Line’ is one of their best albums and a great example of the genre. It holds up really well to this day and was probably the best line-up of the band… and man, have they had their fair share of line-up changes. It’s German heavy metal at its finest!